Burping, also known as belching, is characterized by the release of gas from the stomach via mouth, which may be accompanied by a sound and sometimes an odor. Burping is quite natural and occurs in every human being at some point of time or the other. However, constant burping is unnatural and may indicate an underlying problem of the gastrointestinal tract. Simple home remedies may help relieve the discomfort burping brings while it is necessary to find out and properly treat the root cause. Causes of constant burping can range from very benign conditions such as swallowing of air to life threatening ones such as gastric cancer. Here lists some possible causes of constant burping. One of the most common causes of constant burping is swallowing of air, also known as aerophagia in medical parlance. Aerophagia or swallowing of air tends to occur when you drink aerated drinks or eat too fast. Aerophagia also occurs when you drink liquids with the help of a straw. Poor dietary habits are more often than not the cause behind constant burping. Eating too much of fatty and highly processed foods, and fast foods leads to excessive gas production in the digestive tract. Eating too many chocolates and too much acidic foods also has a similar effect. There are many vegetables such as beans, onion, cabbage etc. that cause formation of excessive gas. Gastric outlet obstruction and bowel obstruction and accumulation of undigested materials such as hair, food or other objects that are swallowed accidently also leads to excessive formation of gas in the stomach. There are a wide variety of digestive disorders that can lead to excessive formation of gas and as a result, constant or excessive burping. Some of these common digestive disorders include gastroesophageal reflux disease, gastritis, irritable bowel syndrome, hiatal hernia and gastric ulcer,. Eating fatty food also leads to excessive production of gas or flatulence. IBS. Irritable bowel syndrome is characterized by symptoms of alternate constipation and diarrhea, bloating, excessive gas formation, constant burping and pain in abdomen. The condition has no cure but the symptoms can be controlled by eliminating certain foods from your diet and by remaining stress free. Gastroparesis. Gastroparesis or partial paralysis of stomach occurs when the stomach muscles become weak and are unable to propel the food to the small intestine for digestion. Due to this the food remains in the stomach for longer duration than normal. This leads to excessive gas formation, resulting in symptoms of constant burping, nausea and vomiting. Gastric Cancer. 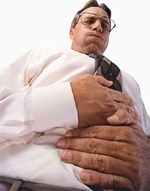 Gastric cancer is also one of the causes of constant burping. Other symptoms of gastric cancer are nausea, vomiting, pain in abdomen and bleeding. The condition should be treated promptly so as to avoid metastasis of the cancer to other areas of the body. Excessive burping is a quite natural phenomenon during pregnancy. During pregnancy, the digestion is slowed down because of the relaxation of muscles of the digestive tract due to presence of high levels of progesterone hormone. This leads to symptoms of flatulence, bloating and constant belching. The condition is also aggravated by inactivity during pregnancy. As already discussed, burping is a common symptom during pregnancy; hence, you can’t do much to stop it. However, getting yourself engaged in routing activities and simple exercises such as walking may help alleviate it to some extent. Apart from pregnancy, regular exercise is a good way to relieve burping in other individuals too. Exercise has multiple health benefits including promoting digestion of foods and preventing indigestion and flatulence. Eat and drink slowly. Aerophagia results from quick eating, hence, eat and drink slowly to prevent gulping of extra air. Don’t eat while you are stressed; instead, eat in a relaxing and calm environment. Wear loose clothing especially around the waist area as tight clothing can result in flatulence and abdominal discomfort. Do not breathe with your mouth as it leads to swallowing of air. Whenever possible, breathe through your nose. Similarly, avoid eating with your mouth open. Do not remain nervous and anxious as anxiety and nervousness is associated with involuntary gulping of extra air. Limit the intake of carbonated or aerated drinks. Do not smoke or chew gums. Limit the intake of alcohol, tea and coffee. Limit the intake of foods which produce excessive flatulence such as beans, lentils, broccoli, cauliflower, chocolate, onions, apples, peaches, sugar etc. Certain herbs have anti flatulent properties; hence their intake results in relieving constant burping, some of which include chamomile, mint, fennel, burdock and ginger. Some foods such as fenugreek seeds and yoghurt help in preventing constipation and improve digestive health. Medications such as over-the-counter antacids to relieve gastroesophageal reflux also helps in combating constant burping. If your symptoms are due to some underlying illness, then treating that illness is the best possible way to relieve constant burping. If constant burping is not relieved by taking appropriate preventive measures and also over the counter medicines, then you should see a doctor to get yourself examined and diagnose the possible or the underlying medical disorder. As we have discussed that constant burping can be a symptom of many underlying digestive disorders such as gastritis, gastroesophageal reflux disease, gastric cancer etc, prompt diagnosis and treatment by a physician can help relieve the symptoms.